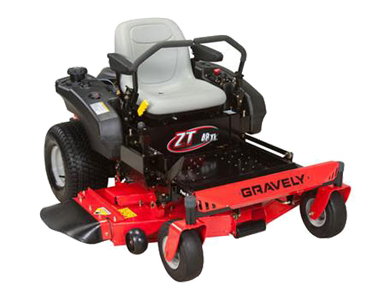 Comfort, control and speed are guaranteed with this Gravely ZT XL 42 inch Zero Turn Mower. More torque is provided by the Hydro-Gear ZT-2800 and a powerful performance is given by its 24 HP Kohler 7000 Series Pro engine. Stability is offered with the low center of gravity and the tubular frame that has welded construction for extra strength. Plus, the 42" fabricated cutting deck allows you to choose between 12 cutting positions with the pedal assisted deck lift. Kohler 7000 Series Pro: Powerful performance is provided by the 24 HP Kohler 7000 Series Pro engine. Low Center of Gravity: Increase stability on uneven terrain. 42" Fabricated Cutting Deck: Efficient cut quality is provided by the 7 cutting steps ranging from 1.5-4.5 inches for the perfect cut every time. Foot-Pedal Deck Lift: Choose your height of cut by simply using the spring-assisted foot pedal deck lift. Hydro-Gear ZT-2800: More torque and power is offered with a series of transaxles. Floor Pan: Access to the top of the mower deck is easily granted with a flip up floor plan for routine maintenance. Mowing Speeds: Reach an impressive 6.5 mph to move through lawns quickly. Tubular Frame: Built for sturdiness and strength with the welded construction and competitive bolted together frames. Sliding Seat: More comfort is available by sliding the high back seat with armrests to the front or back depending on your needs. Click the button below to add the Gravely ZT XL 42 inch 24 HP (Kohler) Zero Turn Mower to your wish list.